Russia’s Far East region is full of volcanoes, including some of the largest in Eurasia. Take a look at 12 of these enchanting giants that form Russia’s link in the Pacific Ring of Fire. This is the highest active volcano on the Eurasian continent. Its peak is nearly 16,000 feet above sea level. The volcano is approximately 7,000 years old. It has experienced 50 powerful eruptions in the past 270 years. During it 2004-2005 eruption, the column of ash reached an altitude of 26,000 feet. The most recent eruption occurred in 2009. The Klyuchevskaya volcano draws many mountain climbers and tourists, but it has also claimed a greater number of victims than any other Kamchatka volcano. In 1978, the camp of some young glaciologists was hit by a volcanic bomb that flew out from the volcano during a powerful explosion; one of the scientists was killed. This volcano is 11,300 feet high. The peak of the volcano has a modern crater, 590-650 feet in diameter. The volcano is located only 22 miles from the territory’s capital, Petropavlovsk-Kamchatsky and contributes to the panoramic views from the city. In 1996, this volcano was listed as a Decade Volcano, one of 16 volcanoes around the world that the UN International Association of Vulcanology and Chemistry of the Earth’s Interior found deserving of special study because of their history of activity and proximity to modern-day settlements. In December 2008, Koryakskaya Sopka emitted a column of steam and gas that could easily be seen in photographs taken from space. Its most recent eruption was recorded in 2009. This volcano is 8,992 feet high. Its crater is 1,300 feet in diameter. Avachinskaya Sopka is one of the most visited Kamchatka volcanoes. It is located near Petropavlovsk-Kamchatsky and offers an easy ascent. There is a path to the peak of the volcano that takes an average of six to eight hours to climb. No special training or equipment is needed for the ascent during the summer months. The volcano’s most recent eruption was recorded on Oct. 5, 2001. This 5,967-foot-tall volcano is located on Kunashir Island in the Greater Kuril Chain. The peak of the volcano is often observed to be smoking, releasing poisonous gases from a lateral crater. This is one of the reasons why the northeast part of Kunashir, where Tyatya is located, is sparsely populated. In the language of the Ainu, the indigenous inhabitants of the island, the volcano was called Chacha-Napuri, or Father Mountain. The Japanese named it Tyatya-Yama, from which the Russian name Tyatya. Tyatya is one of the symbols of Kunashir. Local people consider it the most beautiful volcano, and its image, which can be seen everywhere in these parts, is the unofficial symbol of the Kuril Islands. Tyatya’s most recent eruption was recorded in 1981. This volcano’s frequent eruptions may have contributed to its small size; it stands only 5,000 feet tall. Karymsky has erupted more than 20 times since 1852, and many of its eruptions have lasted several years. The eruption of 1996 went on for more than five years. It was also unique because it occurred simultaneously with an underwater eruption in the Karymsky Lake, which is situated about 4 miles from the foot of the volcano. Over the 18-20 hour eruption, there were over 100 underwater explosions in the lake, producing tsunami waves of up to 15 meters. The lake was literally boiling: its temperature rose sharply, while the salts and acids in the water rapidly reached such levels of concentration that all the animal and plant life in the lake perished. The most recent eruption was recorded in 2010. This mountain is located 43 miles from Petropavlovsk-Kamchatsky and is volcano is 9,700 feet high. The volcano’s development began 50,000 years ago and today it is a ridged formation of four merged cones, covered by glacial sheets and permanent snowpack. The western cone is 8,202 feet high and topped by a crater 1,640 feet in diameter. Its 1957 eruption continued for four months. The most recent eruption was recorded in 1959. This is one of the largest volcanoes of South Kamchatka. It has a complex structure and a long history of development. The volcano is 7,621 feet high. The Mutnovsky Geothermal Power Plant is located not far from the volcano. In April 2008, Russian parachutist Valery Rozov made a jump into the crater of the Mutnovsky volcano. The volcano has erupted at least 16 times in known history. The strongest eruption occurred in 1848. The most recent eruption was in 2000. This eruption created a lake, which is now almost always covered with ice, even in summer. This is the northernmost and highest volcano in the Kuril Islands. The volcano is 7,673 feet high and is located on Atlasov Island. It may be more accurate to say that the volcano is also known as Atlasov Island, since the island itself is the above-water part of the volcanic cone. This volcano has over 30 lateral cones spreading over its based and on its slopes. They are concentrated in several groups. Alaid forms a single volcanic formation with the Grigoryev underwater volcano. Alaid erupts every 30 or 40 years; its most recent eruption was in April 1996. This 3,871-foot-high volcano was named by vulcanologist Vladimir Vlodavets named the volcano in 1939. Karymsky Lake, which is around 230 feet deep and 2 miles across, is situated on the north side of the volcano. Encircled by high slopes, the lake is very picturesque. South of it rises the smoking Karymsky volcano. On the opposite side, the Academy of Sciences ridge can be seen. Its dome-shaped peak area, with jutting cliffs, drops off symmetrically on both sides, resembling a bat with its wings spread. The volcano’s last eruption was recorded in 1996. This volcano is 9,455 feet high, with a crater nearly a mile wide. It was named after a famous eruption on March 30, 1956. Soviet scientists called this new type of eruption a “directed explosion” or “Bezymianny type” (meaning “nameless”); the terms were later adopted in world vulcanology as the “directed blast” or “Bezymianny type” of eruption. The 1956 eruption began with powerful ejections of ash, rising to an altitude of more than 4 miles. After this, a huge explosion shook the surrounding area, shooting a billowing cloud of ash to an altitude of 21 miles. The peak of the volcano was destroyed, replaced by giant crater. This explosion reduced the height of the volcano by 820 feet. The 1956 eruption is considered one of the greatest in history. Vegetation was burned in an area stretching for 15 miles while an area of 200 square miles was covered hot ash, sand, and rock fragments, destroying all vegetation. The volcano’s most recent eruption was recorded in 2009. 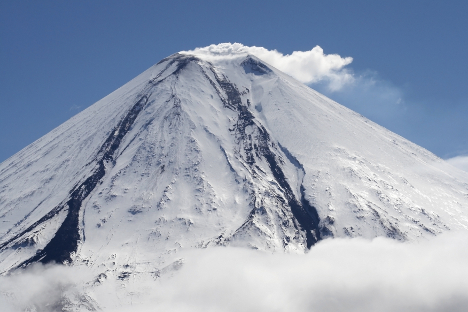 Sarychev Peak is one of the most active Kuril volcanoes. It is constantly smoking, and from time to time emits lava flows, which travel from the crater down the northeast slope. The most recent eruption of the volcano was recorded in 2009. Standing 10,770 feet tall with a base that measures 25 miles by 31 miles, Shiveluch is one of Kamchatka’s largest volcanoes. It is also the peninsula’s northernmost. One of its strongest recent eruptions took place on Nov. 12, 1964, when the volcano emitted a column of ash that rose to an altitude of 9 miles, while mud and fragments of volcanic rock carved a 12-mile-pathway stretching away from its base. The volcano most recently erupted in April 2012.